It's time to get outdoors. But if your outdoor area isn't looking its best, it's time to fix it up. We've got the trends you'll want to focus on to give you the best yard on the block. Outdoor living isn't just about being outside. Today, it's about bringing all the comfort of the indoors out. "The number one trend this year is a seamless transition from your home to your outdoor space using outdoor rugs, ottomans and side tables, and layered blankets and throw pillows," said Country Living. "The backyard/porch has truly become an extension of your indoor space," Melissa Simon, Public Relations Manager at Pier 1 Imports, told them. "One of our new favorite trends this season is decorating with furniture and décor that looks like it was created for the indoors." 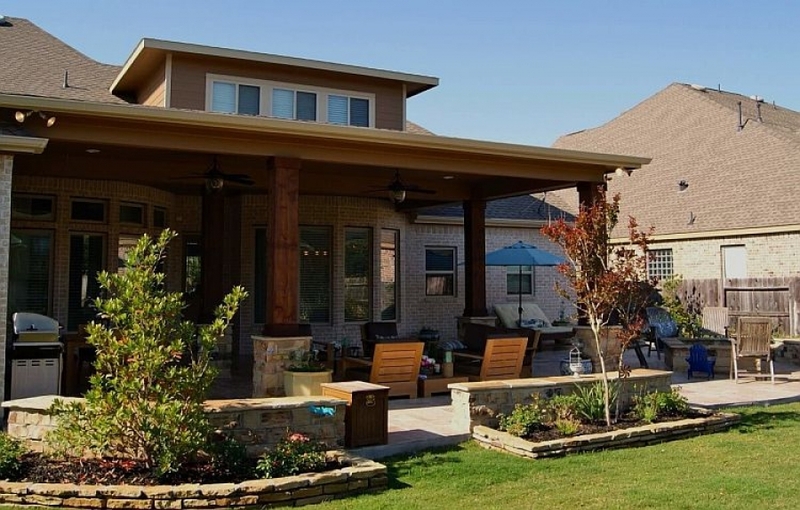 Patio covers that are an extension of the house are more popular than ever. These spaces allow you to incorporate similar architectural details to what you already have on your home and also add features like heating and fans or misters. With the indoor-outdoor trend showing no signs of slowing, having a covered area for lounging or dining can be a valuable addition to your home. But if you can't afford the many thousands of dollars for this item, you can get a similar feeling with a pergola or gazebo. A sunsail or umbrella offers even less expensive options. Look for an umbrella with enough coverage and a cantilever so you can move it around as the sun moves around. "According to a report from the National Hardware Show, lighting is becoming an important feature of outdoor spaces," said Enlightenment Magazine. "Whether it's illuminating key architectural or landscaping accents, adding a level of security or safety, or providing ambience for entertaining areas, outdoor lighting is now high on the list for many consumers." Among the most current lighting trends for outdoors, eco-friendly options top the list. "According to a Houzz.com survey of 4,500 users, 7 in 10 homeowners are illuminating their hardscaping," they said. "The survey also found that the majority are making eco-friendly choices for their yards, noting, ‘Of the two-thirds of homeowners who are updating the lighting in their yard (65 percent), a majority is going green with LED (58 percent) and solar-powered lights (56 percent). Homeowners in rural neighborhoods are most likely to choose solar-powered lighting.'" If you're getting ready to plant, keep in mind that, "Low-maintenance gardens, drought-tolerant plants and less turf grass have become the norm in landscape design," said HGTV. "Homeowners now assume sustainable design will be a major part of the plan - both for economic and environmental reasons." Another hot trend in today's gardens: farm-to-table. "Edible gardens may have been overlooked and forgotten over the past couple of years, but they are making a comeback to the landscaping scene," said Evergreen Gene's. "Use this trend to help your healthy eating resolution for the new year if you have one. Fresh fruit and vegetable gardens are not only aesthetically pleasing, but they provide healthy food options that you and your family can enjoy. An edible garden will also help maintain or jumpstart a vegetarian diet." Suburban homes haven't cornered the market on outdoor enjoyment. Some of today's city dwellers are increasingly going to great lengths to create inviting and show-stopping spaces. Have a condo with a small outdoor space? 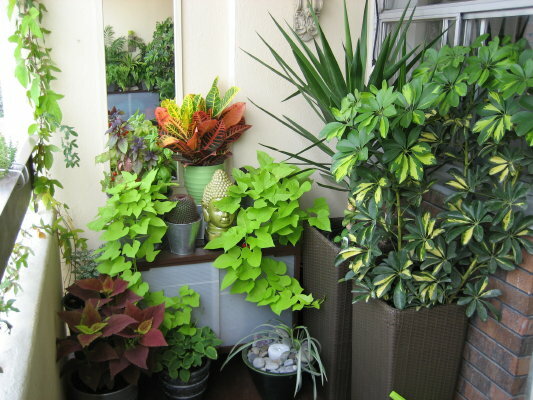 You'll appreciate urban outdoor trends including container gardens to make your patio shine. It's time to look beyond the "typical" outdoor kitchen. That doesn't mean giving up your grill. But maybe you add something new this year. "Wood-fired or hearth-baked pizzas are no longer just a restaurant order," said Turf Magazine. "Homeowners who want this unique, artisan flavor on their pizzas are purchasing stand-alone outdoor pizza ovens, as well as portable units that utilize grills for their heat source, which means they also make nice tailgating accessories." Smart tech isn't just for indoors. Integrating your outdoor living area can make your life easier. "Your smart phone has the capability to manage many pieces of your daily routine and outdoor living is no exception; great technology doesn't have to stop at the door," said Masterplan Landscape Design. "Integrating Wi-Fi controls to your outdoor audio-video packages lets you enjoy your party without having to leave to control the volume or channel! There are also specific outdoor lighting systems, fire feature, irrigation and water features that can be controlled by a smart phone with the opening of an app. While most needs can be taken care of with timers, you can go one step further and have the controls at your fingertips from anywhere in the world." Water features continue to be a top trend for outdoors. But that doesn't mean you have to build a pool. Add a fountain, which not only looks great but also adds a peaceful element to your outdoor space that can help lower stress. Aquascape has some great ideas for small-space water features. Prefer to go the pond route, which is also popular? Check out Family Handyman for some DIY ideas.